OK, here’s the link to see the ad posted at Entertainment Weekly. Hilarious. Enjoy. For those unfamiliar with the This is SportsCenter campaign I say, where in the world have you been? ESPN has been running the campaign for years, and it’s one of the most brilliant advertising efforts ever created. Yes, I said that recently about another campaign, but it’s true in this case as well. I could watch these spots for hours. In fact, if they released them in theaters, I’d probably throw down the ten bucks to see them on the big screen. That’s how fun they are. And the idea is so simple. SportsCenter is so close to the world of sports that athletes and mascots are actually on site, often working there, in the editing suite, in the cafeteria, out in the parking lot. The place is just oozing with athletes. Simple. Genius. High-totin’ hilarious. The latest spot however deviates from the athlete strategy. 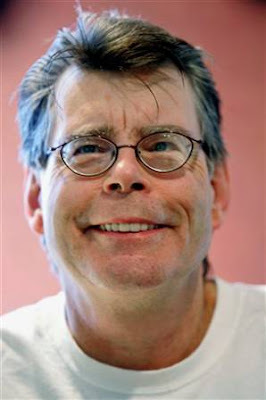 This one stars Stephen King, a long time Boston Red Sox fan and occasional sports writer. SportsCenter has hired King to write reports and give the show a new writing perspective. The only hang up? King is injecting his sports reports with “demons” and players with “telekinesis.” Funny. King may not get an Oscar for his performance, but this one’s a home run in my book. On a similar note, a few months ago one of the brand managers at ESPN came and lectured at our agency about the ESPN brand and the history of the SportsCenter campaign. I found it fascinating. The most interesting tidbit: the offices featured in the ads are the real thing. They don’t build sets for these shoots. Those are real SportsCenter cubicles. The people milling about (athletes excluded) are real employees. Cheap and effective. Please, SportsCenter. Don’t stop. Keep these coming.